Be sure to check out the 2018 Year in Review to learn about the three pillars of parks and recreation, how we connect our residents with recreation opportunities, and a look ahead to pending future projects. We invite you to take a look at the 2018 Year in Review. 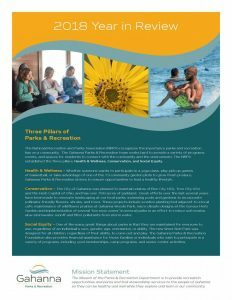 Learn about the three pillars of parks and recreation, how we connect our residents with recreation opportunities, and a look ahead to pending future projects. 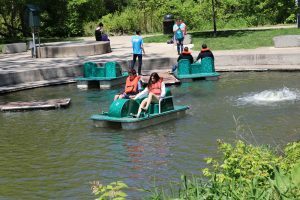 There’s a park in Gahanna for you if you want to take a walk, fish, explore nature, escape the city-life, climb on a playground, play a sport, or just sit back and relax. Find your park here. 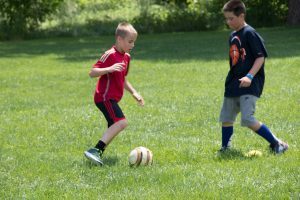 Mission Statement: The Mission of the Parks & Recreation Department is to provide recreation opportunities and parks and trail stewardship services to the people of Gahanna so they can be healthy and well while they explore and learn in our community. 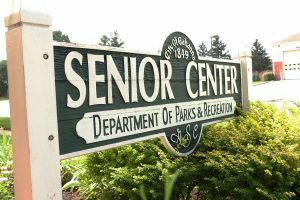 Welcome to the Senior Center, home of our Active Senior Programs! 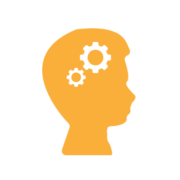 We are proud to offer a variety of programs and activities to meet the growing needs and interests of our community. Get started with your membership today and begin participating any of our programs right away! We look forward to getting to know you. Welcome to Gahanna Swimming Pool and Hunters Ridge Pool! 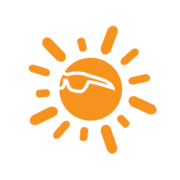 Cool off during the hot summer months at Gahanna Swimming Pool or Hunters Ridge Pool. 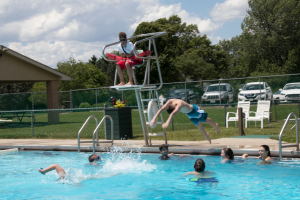 Enjoy lap swimming, 12’ diving wells, swim lessons, swim teams, concession stands, playgrounds, covered rentable shelters, special events, and parties, handicap accessibility, and shaded and open grass areas. Families and individuals are welcome to explore many pool membership options, purchasing online is a quick and easy. We will see you at the pool! Hunters Ridge Pool, 341 Harrow Blvd. Gahanna Swimming Pool, 148 Parkland Ave. 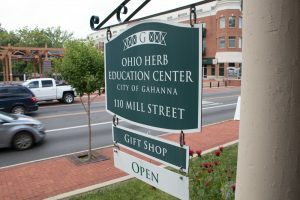 Welcome to the Herb Capital of Ohio! 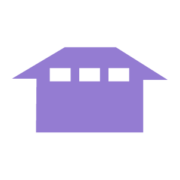 ter of Historical Places with the original structure being built in 1855 and additions made to the home in 1910. The center includes a gift shop, parlor and kitchen and is used for classes, parties, meetings and rentals. We define herbal education in the following categories: Tea, Gardening, Traditional Medicines, Culinary and Craft. 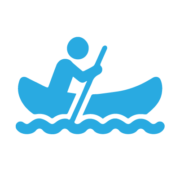 Get Active in Gahanna’s Great Outdoors! Explore parks and neighborhoods throughout Gahanna on a connected bikeway or trail and enjoy the scenic views along the Big Walnut Trail. 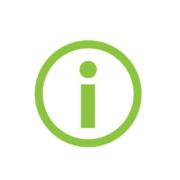 The Gahanna Department of Parks & Recreation maintains of the bikeways, nature trails and multi-purpose trails in Gahanna. 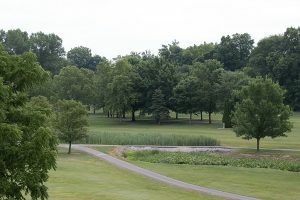 These trails are located in many public parks within Gahanna, and the vast majority are paved, conveniently located near parking lots, and are handicapped-accessible. 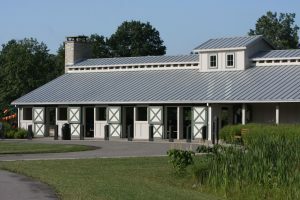 The Gahanna Department of Parks & Recreation maintains park shelters available for public rental at Friendship, Hannah, and Woodside Green parks. Shelters are also available at Hunters Ridge Pool and Gahanna Swimming Pool. Indoor space is available at the clubhouse at the Gahanna Municipal Golf Course, the parlor at the Ohio Herb Education Center and the Senior Center. Please contact us if you are interested in renting the Rotary Stage on the back, upper plaza area at Creekside Plaza overlooking the Big Walnut Creek. 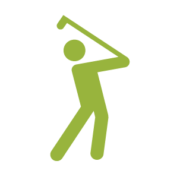 Get active with these programs designed to keep you moving all year long! 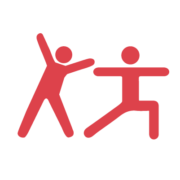 Programs span all activity levels and ages, from in-house Parks and Recreation programs to those run by third-party organizations. Explore parks and neighborhoods throughout Gahanna on a connected bikeway or trail and enjoy the scenic views along the Big Walnut Trail. 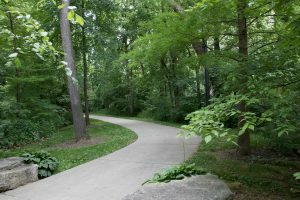 These trails are located in many public parks within Gahanna, and the vast majority are paved, conveniently located near parking lots, and are handicapped-accessible. This map is best used in Chrome, Safari, Internet Explorer, and Edge browsers. 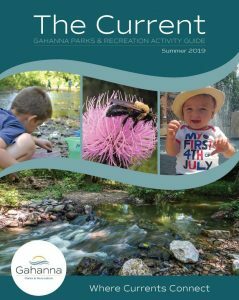 Have you seen our new summer activity guide, The Current? 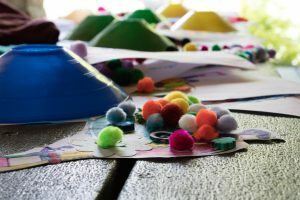 It’s packed full of events and activities for everyone in the family. Get all the info you need for pools, camps or time out on the Big Walnut Creek or our affordable 9-hole golf course.